RUSH: The march on Saturday with the kids and the guns, the whole thing was right out of the left-wing community organizing playbook. It was a voter registration drive. It was not about guns. It was not about saving lives. It was about promoting the left’s agenda. It was about trying to get rid of the NRA and trying to get rid of the Second Amendment, but it wasn’t about saving lives. And, by the way, can I ask a simple question, you know, I’m gonna date myself with this question, but in David Hogg character, this student that’s running around, this guy’s dropping the F-bomb at least twice in every sentence. And I’m asking myself, are this guy’s parents proud of him? (interruption) Well, did he call his own parents idiots? I know he called adults idiots. Oh, he did! ‘Cause he said his parents can’t figure out how to iMessage, which means they can’t figure out how to do — “Here, give it to me, I’ll send it, you can’t figure it out.” He did. He called his parents dumb. If I had spoken to anybody the way this kid does, my parents would not have put up with it. And they would have told me what-for in no uncertain terms for my good. Not to be punitive or any of the sort. I wonder, when I see young people off the rails and behaving in really destructive ways — and make no mistake; this kid Hogg is on a self-destructive path and he doesn’t know it, and nobody seems willing to help him. The Democrats and the media want to encourage this kid to go ahead and act out this way and it’s not gonna serve him well down the road. He’s gonna look back on this in a number of years and be embarrassed by it. Maybe not. Maybe he doesn’t have that kind of humility. We’re talking about teenagers after all. But I don’t know, do you have kids, folks? Would let your 17-year-old go on TV and start dropping the F-bombs in YouTube interviews and on national TV and so forth. Or would you be proud? Would you be embarrassed? I don’t know. These are the things that I ask myself. We’ll have more on the march and the usual disputes over the numbers. In fact, you know what? Let’s do that now. Let’s do that now. There’s a dispute on the number of people, and it’s always the case. It’s just like this Facebook/Cambridge Analytica thing. So now all of a sudden, a conservative- or Republican-connected group uses Facebook data to their advantage in an election? All of a sudden, we’ve got a privacy problem. All of a sudden, we got a security problem. When Facebook and Google live at the Obama White House and engage in all of the use of this private user data, the Obama campaign was bragging about how they sucked up every bit of user data that Facebook has — and they’re being called geniuses! So here comes a Republican-centered group or a conservative group and they end up with the data on 50 million people. All of a sudden, we’ve got a crisis! We’ve got a user, privacy, secrecy crisis. I mean, I tell you, it’s absurd! And what the left is upset about is that their own technique is being used by a bunch of right-wingers, and that’s what they gotta shut down. Well, it’s the same thing here. We have the march and — as always — we have inflated numbers. They’re out there saying 800,000 people showed up for the whatever they called this thing on Saturday. In truth, according to the outfit that has a scientific way of measuring crowd size at public demonstrations in Washington… They use satellite photos, data, all kinds of stuff. They said the crowd was more like 200,000, which is not a bad number. I mean, it’s a lot of people. But it’s not 800,000. So what we wanted to do here is go back to the Grooveyard of Forgotten Knowledge, Grooveyard of Forgotten Enlightenment. Perhaps the largest public demonstration in Washington occurred back in the 1990s under the guise, the leadership of Calypso Louie Farrakhan. It was called the Million Man March. There were disputes then because it was widely believed that a million people didn’t show up, and I can attest to it. I mean, we watched it. Half the people I saw didn’t even know where they were. They were there, but they didn’t know why, and Farrakhan’s going on making a speech and there were blank stares on these people’s faces. But they still got the bodies out. So what we thought we would do is help you using the Million Man Math Made Easy formula as popularized by Louis Farrakhan. JOHNNY DONOVAN: You may be surprised to learn that 1 + 1 = 19. The secrets to this ancient mathematical system are now revealed in the Million Man Math Made Easy Video System. FARRAKHAN (impressionist): Do you ever wonder why things just don’t add up, and you don’t understand the division? Need answers? Well, now there’s help. Hi. I’m Minister Louis Farrakhan, and with my Million Man Math Made Easy, you’ll be able to go through life knowing who’s got your number and why. Learn about the secret of 12 letters in Rush Limbaugh’s name, the seven so-called board members of the Federal Reserve System — and what they add up to. Learn a unique multiplication system that can turn a half a million into over two million — and that’s just T-shirt sales alone. This Million Man Math System, stolen from our ancestors many years ago, is now available to you. So order today. Make sure you count. FARRAKHAN: Wait a minute! Don’t you listen to some white cracker named Johnny! You can order it for $59.95. Order today. FARRAKHAN (impressionist): Hello. I’m Minister Louis Farrakhan here with great news. FARRAKHAN: Many millions have ordered the Million Man Math Made Easy System. FARRAKHAN: However, some customers are calling asking for a refund of their money because they do not understand the Million Man Math Made Easy System. FARRAKHAN: — who will come into your home and stay until you understand the Million Man Math Made Easy System. JOHNNY DONOVAN: Do what thousands have already done and order the Million Man Math Made Easy Video System. 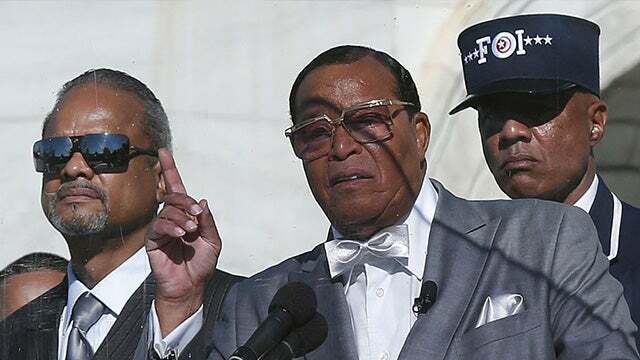 FARRAKHAN: Wait a minute! It’s not thousands! It’s millions. Million Man Math Made Easy. Order yours today. FARRAKHAN: Hello and welcome to Minister Farrakhan’s Neighborhood. Do you know what time it is? It’s time once again for the Million Youth March which almost had to be canceled because of the powerful forces of evil. Can you spell “evil”? Wait. No. Let me help. (bouncy piano riff) R-U-D-O-L-P-H, G-I-U-L-I-A-N-I. That’s right, Rudolph Giuliani, the mayor of New York. Of course he likes to be called Rudy. Do you know why? Because Rudolph is Italian for Adolph! But the Million Youth March will not be a Nazi or Klan really with 15 fat white crackers with bullhorns from Indiana. No! It will be a celebration of unity by millions of other children just like you. So don’t miss the fun and games, because after a few brief inspirational remarks by Khalid Abdul Muhammad, the fun begins. You can win a prize at the Barricade Jump, the Trashcan Throw, or the Bottle Toss — or you can try your luck at the Restrain Escape. It’s gonna be a lot of fun, and you don’t want to miss it. (bouncy musical riff) Remember children! “Sticks and stones may break my bones, but Rudy will not stop me!” Until tomorrow. Bye-bye. RUSH: Well, that’s not the one I thought it was, but that does get to the Million Youth March. The point here, folks, is this is back in the nineties, and this is simply the Democrat Party replaying and re-implementing the same technique, the same standards, and the same media coverage to make it look like something is brand-new when it’s really not. 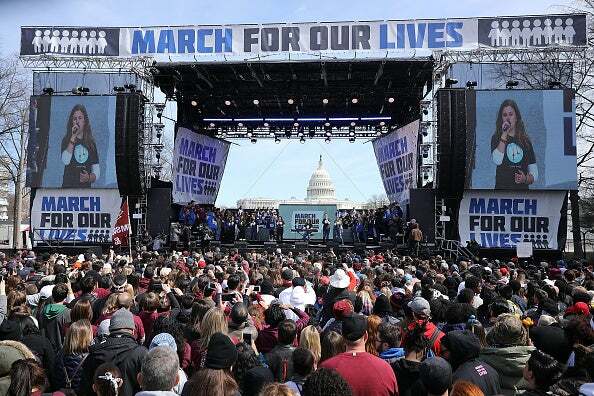 Of course, this march and all these kids could not have happened without money and time donated by the Democrat Party and its affiliates made to look like something spontaneous with a bunch of seriously involved kids and children — who are infallible, of course. We cannot question them. We cannot criticize them. They were targets; they were victims; they were survivors. And, as such, they can’t be questioned. So this is how the Democrats do it. They put people into the political system, then build a cocoon around them where you can treat them as political entrants, and you can’t challenge them, and you can’t criticize them. In this way the Democrats have perfected a technique, and the media is right there promoting everything. RUSH: Where was the disclaimer for this kids march on Saturday? Who spent the millions of dollars to organize this thing? Which was an anti-Second Amendment rally, which means you had a bunch of kids marching to deprive certain people of their constitutional rights. Somebody paid for this, somebody organized it — and it was purely political. You want to talk about campaign finance violations? Where was the disclaimer? Who bought and paid for it? Well, we know who paid and paid for it. RealClearPolitics: David Hogg: "Our Parents Don't Know How To Use A F*cking Democracy, So We Have To"